At summer's height, gardens deliver veggies faster than we can eat them. Here's a tasty way to put that bounty to use! Heat a wok or large nonstick skillet over high heat. Add 2 tsp. oil and heat until oil shimmers. Add zucchini, squash, greens, and bell pepper to the wok. 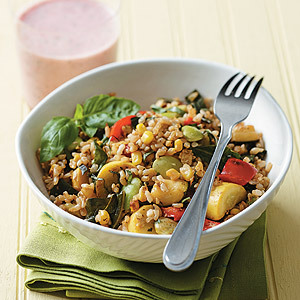 Stir-fry until vegetables start to brown and soften, 3–5 minutes. Stir in lima beans and corn, stir-frying just until softened, 2–3 minutes. Add scallions, garlic, and thyme, stirring until garlic is no longer fragrant, about 1 minute. Stir in Tabasco. Stir in rice and zest until rice is heated through and just starts to brown, 3–5 minutes. Make a 3- to 4-inch-wide well in rice and vegetables; heat remaining 1 tsp. oil and stir in the eggs. Continue stirring constantly in the well until eggs are almost scrambled. Then stir eggs into the rest of the stir-fry. Season with soy sauce and basil. Divide stir-fry among 4 bowls. Stir often to keep the vegetables moving in the wok. This ensures they´ll cook quickly and evenly. Form a well in the center of stir-fry to scramble eggs. This keeps them contained so they´ll cook faster.